The D4 development once promoted by Sean Dunne is about to come to the market at less than half its original cost. Property firms Savills and Eastdil Secured will conduct the sale. Ulster Bank and Rabobank control the company that owns the site. Dubbed ‘Project Trinity’ the 6.8 acres of development land is expected to attract serious attention internationally. Savills and Eastdil have issued statement saying the planned development was “laid out in 12 distinct blocks, some of which are stand-alone pavilion-style residential buildings with gardens fronting Lansdowne and Pembroke Roads. “New terraced apartment buildings will form around new landscaped courtyards and gardens, with a large retail centre and a stand-alone hotel fronting a new plaza onto Pembroke Road. The new building form echoes the existing villas and terraces of the surrounding streets and squares,” they added. 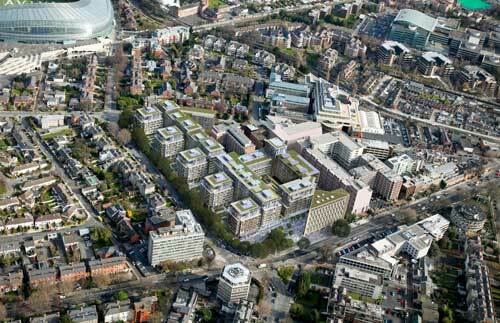 Savills’ Tom Barrett said there was “no other opportunity” of this size in Dublin. The site has planning permission, valid until December 2021 which is for a 1.5m sq ft new urban quarter comprising 490 apartments, a 152-room standalone hotel and 77,000 sq ft of retail and associated commercial and leisure space. The master plan design by architects O’Mahony Pike provides flexibility and the potential to build it out in a staged way. The development provides for predominantly top-end homes within a new urban landscape of pedestrian streets and a public plaza.